Motor Scooters Guide For Motor Scooter Lovers! For Motor Scooters Lovers Far & Wide! 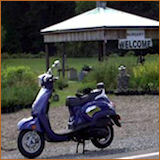 At Motor Scooters Guide.com, scooter lovers of all shapes, sizes and scooter brands will find a home... and tons of quality information on gas scooters too! The sun is brightly shining on your face, as the exhilarating breeze rushes past... You ride along with a big fat grin on your face, because... scootin' is just so dang much fun! Yes, folks, if you just gotta scoot, then this site is for you. 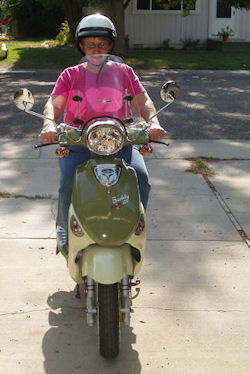 My name is Kathi, and in my early 50s, I became a convert to scootering. And once I discovered the joy of scootering, I never looked back. When I moved to Boise, Idaho in the spring of '07, I started noticing scooters all over the place. Many of the ones I was seeing at first were the really big ones, that look almost like motorcycles, except that they have the step-through design. I was entranced, and I started asking questions. Seems motor scooters were becoming more popular as the gas prices were rising. 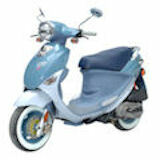 And they weren't just the little Vespas most of us are familiar with from Europe and Bermuda. These were real, street-legal vehicles that could hold their own against the Harleys and the Beemers and other motorcycles. I have to admit it... I became obsessed with the idea of getting my own motor scooter. I'd never driven a motorcycle in my life. But it sure looked like fun! And I was intrigued by the idea of better gas mileage. And Boise, being a high desert climate (read: very little rain) is the perfect location for 2-wheel vehicles, because the riding season is long and mostly dry. Plus, I just thought riding a gas scooter would be great fun! But Would a Scooter Be Right for Me? I was a little worried, though, as to whether I could safely handle the new breed of street legal scooters. You see, I'm not even 5-feet tall, mostly due to fairly short legs. I wasn't sure I'd be able to reach the ground with enough stability to keep a 200-pound scooter upright. But I sure hoped I would! 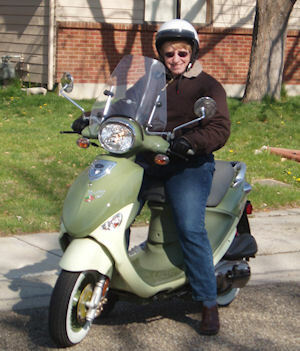 So, being an avid Internet researcher, I started learning all I could about motor scooters... how to ride them... the different size engines and frames available... which gas scooters are best... scooter laws... and so on. 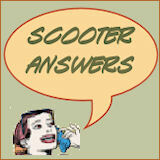 What I found, though, is that it wasn't that easy to find a lot of unbiased information on the Web about motor scooters. 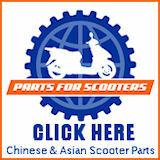 The websites I did find tended to be the sites of scooter manufacturers or dealers, or blogs that had some opinions, but not a whole lot of the kind of factual research information I was looking for. I think one reason it wasn't easy to find definitive information on the Web about motor scooters is because they're still a fairly new idea here in the US. But I'm tenacious once I get my teeth into a topic (some might say obsessed! and I didn't give up until I found some discussion boards with more info (though I had to sift through a lot of junk), and I talked to our local scooter dealer. Eventually, I had enough information to make a decision. And before I knew it, I had my very own scooter! That's it in the header up top... it's made by the Genuine Motor Company and the model is the Buddy. Apparently, the Buddy is one of the best selling models here in Boise. Mine was a limited edition when it came out in 2007, "Series Italia". 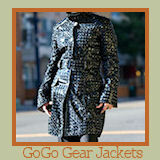 And I absolutely LOVE it! 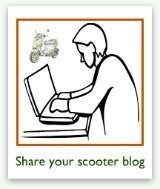 Now, I want to share my passion and my knowledge with other people who are interested in the scootin' life, so being a long-time SBI content site lover and creator, I thought I'd make my own website about gas scooters. So, this site has evolved into being a central place where both current and future motor scooters lovers can come to get the facts, tips, and advice they need... not to mention meeting like-minded souls! If you're ready to get to it, just start exploring the pages on the navigation list to the left... and perhaps I'll see you one day on the road, as we scoot joyfully past each other on our motor scooters!